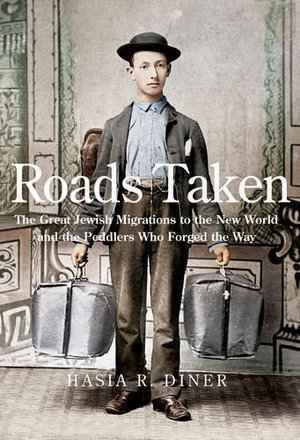 In her 2015 book ‘Roads Taken’, Hasia R. Diner follows the complex interactions of Jewish peddlers throughout the long nineteenth century. Their migrations reveal varying patterns in the networks they built, the trajectories they took and the mutual cultural exchanges they made. As the peddlers set out into their new worlds, they transported goods and news along rural roads. Diner’s emphaisis on the peddler’s agency is one of the book’s great strenghts. By going beyond dominant narratives of victimhood, it challenges the tendency to predominantly focus on anti-Jewish violence and hatred in the retelling of the Jewish past. While Diner does not downplay the historical reality of Pogroms and anti-semitism, she argues that it can not explain everything of bygone Jewish migrations and interactions. Rather, the peddlers amongst her pages took decisions based on the struggles and challenges they faced. The choose to set foot on the road with the aim of economic betterment for themselves and their families. They learned to navigate gendered and racial hierachies, and to negotiate cultural barriers. They tapped into the financial resources within internal economic networks, and they functioned as connectors between rural groups and the outside world. While peddlers did experience danger and violence, this was often nothing to do with their Jewishness but with the fact that they were alone on the road, come hail or snow, carrying cash and goods on their back. The migrational destinations of the peddlers are reflected in the geographic breath of where Diner’s sources are located. Although a listed index of the archive specifics is unfortunately not provided, according to the preface the sources stem from national archives, official censuses and local historical societies in North, South and Central America, in the British Isles and Ireland, in Sweden/Scandinavia, in Austrailia, in New Zealand, South Africa and Namibia. Diner notes that her approach to the sources consisted of moving „from place to place and time to time seeking comparisons, connections and differences” [regarding] “the nature and legacies of Jewish peddling.” With a broad view of the book’s content it can be said that this was indeed carried out. Yet, the book’s organising pricincle doesn’t give particular insight into how this approach guided her research. The chapter titles of ‘Roads taken’ separate out the different temporal stages of peddling, as well as the positive and negatives interactions that these young men experienced. (1. The Migration and the Peddlers, 2. Jewish Peddlers in their New Worlds, 3. Jewish Peddlers and their New-world Customers, .4. Jewish Peddlers and the Perils of the Road and 5. Life after Peddling.) While the content reflects thsee titles, if read sideways, the books real flesh is arguably found in three reoccuring themes: 1. the larger history of Jewish migrations, 2. the social interactions, cultural impacts and exchanges that peddlers made, and 3. the racial, gendered and economic dynamics with which the peddlers found themselves confronted. Diner consequetively deals with the larger history of Jewish migration as a backdrop to the specific history of peddlers in the long nineteenth century. Borrowing concepts from Migration Studies, she examines the push, as well as the agency-driven pull factors which characterised their chain migrations into the New World. Her work details how they built upon, and participated in, networks which carved out the means for production, transportation and sales of goods from one place to another. In the valuables the peddlers carried, such as eyeglasses, clocks and camaras for portaits, they became the transporters of technology and symbols of modernity to the doors of rural Christian families. To the most part, their business was welcomed, with customers by times even inviting them to spend the night or share a meal. Diner enables us to grasp these complex interactions, with her book capturing the mutual exchanges and impacts that the peddler and the customer had on eachother, and their respective societites. The women, for instance, who opened the doors were given a sense of empowerment in being able decide how to react, what to buy and whether to let the peddler in. Likewise, the peddler invited to a Christian table was often challenged to either dilute his observance of Kashrut or stick hardfest by it. Througout the book, Diner carefully places these mutual influences within the racial, gendered and economic dynamics which structured and conditioned such interactions. The peddlers lack of previous connection with their customers required them to become skilled linguists, cultural readers and translators. As such, they learned to navigate hierachries and adapt their sales strategies to varying cultural and social contexts. While the peddlers’ jewishness, for example, often resulted in hatred and discrimination towards them in Europe, Diner illustrates how their whiteness in the new world contexts of the Americas, Austraila and South Africa provided them with priviledge and aided them in their post-peddling integration. In their peddling days however, these young men often shook racial hierarchies by equally selling to indigenous and African decent customers, as well as to settler populations. They too impacted gendered power structures, which had a particular bearing on the lives of poor women. By providing rurally isolated women with credit and a choice of goods, the peddlers facilitated them to develope their own sense of taste. This brought about a new consumer dynamic and materialism, which impacted established gender hierarchies, but also had an effect on local economies and shops. The peddler’s non-seditary flexibility meant he had little overhead, enabling him to make savings on the money he made. He worked outside of the local economy, by drawing any credit needed from Jewish financing structures rather than from town banks. While Diner notes that this often led to the reproduction of certain stereotypes, given the frequency with which she refers to the internal finanzing networks, the book could have benifitted from some discussion on where these stereotypes actually come from. More specifically, with reference to the historical debates on if, how and when large numbers of the world’s Jewish population moved to urban settings, while primarily engaging in economic activities of trade, finance and craftmanship. While further contextualisation can always be asked for, ‘Roads Taken’ is nonetheless a valuable contribution to both Global and Jewish History. It serves as a fine example of how the social and economic structures, which framed past interactions, can be consequetively and critically contextualised within broader historical events and connections. Whether having been under circumstances of conflict or company, Diner frames peddling as a cultural bridge upon which change occurred. By drawing us into the complex lives of peddlers, she successfully achieves the main aim of the book, namely complicating the migrational history of Jewish people. Woven into her pages are naratives of interaction and mutual impact, of structural dynamics and cultural change. The knowledge which she shares with us of these peddlers past, brings a new dynamic to establised narratives on the role of Jewish people in the historical global past. ‘Roads taken’ is a highly enriching read for anyone interested in the relationship of influence between migrants and the societies they entered. It too serves as an example for any scholar looking for inspiration on how complex interactions amid racial, gendered and economic dynamics can be interwoven into a history which nonetheless remains digestable. Ruth Ennis: Rezension zu: Diner, Hasia R.: Roads Taken. The Great Jewish Migrations to the New World and the Peddlers Who Forged the Way. New Heaven 2015 , in: Connections. A Journal for Historians and Area Specialists, 27.10.2018, <www.connections.clio-online.net/publicationreview/id/rezbuecher-30209>.